Pence joined the Washington Post’s "Transformers: Space" conference, and he also convened the National Space Council at the National Defense University. 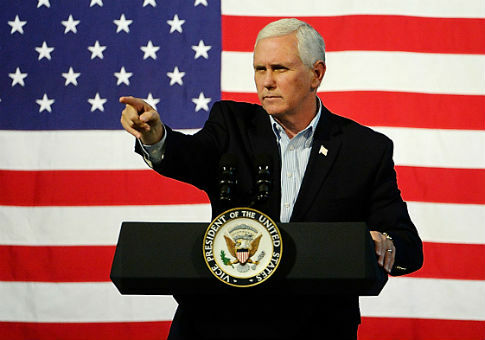 Pence is assisting with the development of the Space Force, including its organization within the existing military chain of command, its funding through Congress, and its relationship with existing government agencies. President Donald Trump, who surprised reporters when he first announced his support for the plan, tasked chairman of the Joint Chiefs of Staff Joseph Dunford with setting up the Space Force in June. During the first, Pence sat for an interview with the Post’s Robert Costa. Pence told Costa, "We are in a very real sense a nation of pioneers." Pence shared the administration’s view that "it’s essential that America remain as dominant in space from a national security perspective as we are on the earth." Asked if he worried about sparking an arms race, Pence noted that the space race, begun during the Cold War, had always been about security. "From the time Sputnik was launched into orbit, we’ve militarized space," he said. "Space is a war fighting domain, whether it’s China, Russia, or other nations the world." To preserve space "as a domain where peace will reign will require military presence." Pence pointed to "broad" bipartisan support for the Space Force prior to Trump’s proposal of the sixth service branch. The last time a new branch was added was 1947. The Air Force, previously the Army Air Forces, became independent through the 1947 National Security Act. In 2015, China and Russia both took measures to develop separate spaces of their own. Some in Congress and the Pentagon have supported doing the same, but the idea has long languished. "Somewhere along the way we lost our vision and passion for leadership in space," Pence said. The idea has gained traction following Trump’s surprise speech on the topic in March. When pressed by Costa about whether Congress would support the effort, Pence was optimistic, pointing to the idea’s bipartisan history. Virginia Democrat Rep. Don Beyer also participated in the Post event. He anticipated that America would successfully reach Mars. In 2017, Rep. Jim Cooper (D., Tenn.) said: "The military has not done a good enough job looking after space with all its other distracting priorities." Later Tuesday, Pence held the fourth meeting of the National Space Council at the National Defense University. Trump had the idea to revive the "National Space Council," which had been inactive for decades. Today, other nations are seeking to disrupt our space-based systems and undermine our economic and military might as never before. For many years, nations from Russia and China to North Korea and Iran have pursued weapons to jam, blind, and disable our navigation and communications satellites through electronic attacks from the ground. But recently, our adversaries have been working to bring new weapons of war into space itself, from anti-satellite weapons and airborne lasers to highly threatening on-orbit activities and evasive hypersonic missiles, both China and Russia have been aggressively developing and deploying technologies that have transformed space into a war-fighting domain. Pence called on the Space Force "to meet the challenges and opportunities on that limitless frontier." The council would be sending strategic recommendations to the president’s desk in the near future. Pence said the council would be voting on a Unified Space Command. The Unified Space Command would be similar to that of the U.S. Special Operations Command (USSOCOM), which grew out of the Iran hostage crisis. A unified combatant command provides a chain of command, coordinates and integrates across the military, and develops doctrine to navigate modern battlefields. Separately, Secretary of Defense James Mattis is to set up a joint Space Development Agency to operate independently of "ineffective bureaucratic structures" to accelerate the development and acquisition of equipment needed for the Space Force. Pence said the White House would be providing rules of engagement for the incipient Space Force of the sort already in place. The National Space Council and the National Security Council will also be reviewing operational authorities to enable soldiers to counter threats as they arise. The council heard testimony from several experts. One of them, Douglas Loverro, was Obama's Deputy Assistant Defense Secretary for Space Policy from 2013-2017. "The U.S. needs a space force," he said. Another, Lt. Gen. (Ret.) Kevin McLaughlin, was President Barack Obama's Director of Air Force Space Operation during his first term, and U.S. Cyber Command Deputy Commander during his second term. McLaughlin told the council, "a space force under a separate department of space would be, in my opinion, the most rapid and most effective path toward an organization able to meet the serious threats that exist right now." He also recommended preserving the bipartisan consensus. Pence said the council would be undertaking a "comprehensive review" of existing and required space capabilities. The Department of Defense is expected to send its proposal to Congress along with its 2020 budget request several months from now. One memorandum produced by the Air Force predicted the Space Force would cost some $3 billion in its first year, and a further $9 billion over the four years thereafter. Though some have protested the expense, experts think the estimate is far higher than the likely actual cost. "This is the highest estimate I think you could possibly come up with," said Todd Harrison of the Center for Strategic and International Studies. "What is the price tag you place on the security of the United States of America?" Pence asked. This entry was posted in National Security and tagged Air Force, Donald Trump, Mike Pence, National Security Council, Space Force, Washington Post. Bookmark the permalink.